Hi everyone. 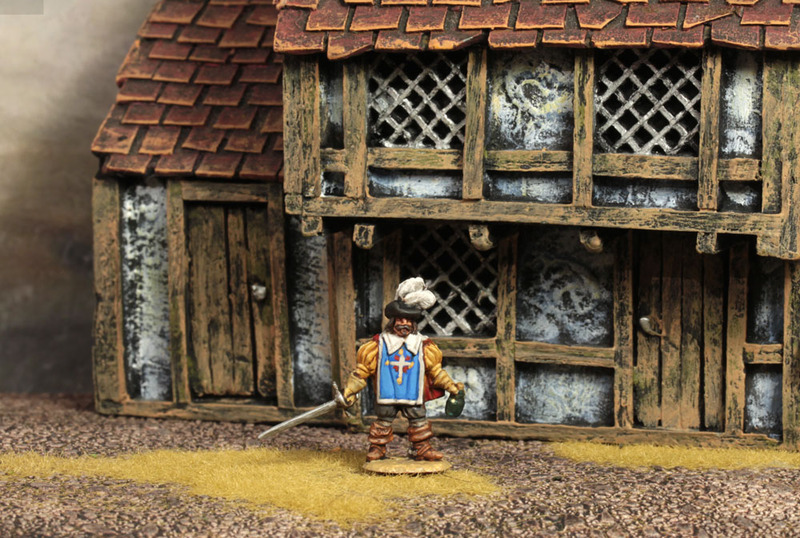 It's been a while since my last post, and I had little time for our hobby, but today I decided to paint my first musketeer from the Ultima Ratio set UR011 "Musketeers of the King of France". Here you are the result, what do you think of it ? The nice painted guy is lonely. Beautifully done. I look forward to more of these guys. Fantastic shading! Helps to have such a great backdrop, too. Excellent painting - "je dis, remarquable, je dis"
I like him! And it is nice to see one example of this set painted! Very nice figure and a very nice building. The shading/highlighting on all of the fabrics is excellent but that glass bottle is incredible, i was convinced it was made of glass. Wiking: the next mini could be either a Cardinal's musketeer, or a King's Musketeer holding a glass. What is best ? To fight or to share the bottle ? PhilC wrote: "Wiking: the next mini could be either a Cardinal's musketeer, or a King's Musketeer holding a glass. What is best ? To fight or to share the bottle ? No doubt...share the bottle, PhilC. Don't forget that they are men before soldiers. And men of the XVII Century loved drink. Great paint work on this figure, congratulations. why the musketeers of the three musketeers fight with swords and not with muskets?aren't they musketeers? J_A_ wrote: why the musketeers of the three musketeers fight with swords and not with muskets?aren't they musketeers? They are swordsman in the story. Musketeers seems like a cool name.